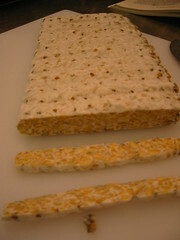 KimmyKokonut » Blog Archive » Hooray for tempeh! « Day 17: kokonut kombucha final product! My first relationship with soy was the obvious soymilk on my cereal, then tofu. I don’t think I knew what tempeh was, even after my mom brought home some store tempeh called “fakin bakin” which was not like bacon, but fun. I didn’t understand it well enough to embrace it and bought it rarely because I was confused about what it was and how to prepare it. My proud first attempt and success! I have ascended in the soy world as I declare my love of tempeh to y’all. It is nutty, mushroomy and full of texture. It is the highest known food source of B12 (eat that, cows! ), it contains beneficial bacteria so the body can digest it easier. It has 40% more protein and 40% less fat PER POUND than hamburger. It’s full of fiber, which tofu has none. And the omnivores tend to dig it more than tofu, in my experience. I have an intimate relationship with tempeh, as I have cultured it myself. It was my entree protein for my 5 course lunch. I will go through the steps in my next post complete with pictures. It is not hard! Anyone can do it as long as they can maintain an environment of 88 deg F for 24 hours, or at least 12 hours. I bought my bacteria strain from GEM Cultures, which is run by the cultural manipulator master, Betty. Care for a slice of yummy goodness? The cost of the starter for 15#: $2.50; The cost of 8 oz dry organic soybeans to yield 13 oz tempeh: $0.70. I did the math. 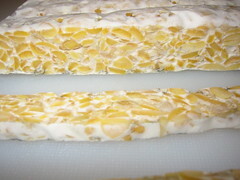 I don’t think anything is wrong with store tempeh, but you can’t beat fresh-made tempeh, no packaging, no delivery trucks and the pure satisfaction of making a simple bean into a paradise for the mouth and belly and soul. I encourage you all to try it. I met a vegetarian today who had never even heard of it before. For real? Open your mouth world, I’m bringing the tempeh to you!